The barnstead is bunk-style self catering accommodation for individuals, families or groups with sleeping accommodation for 22 in four separate rooms, together with a drying room. There is a large fitted kitchen with cookers, microwave, fridges, crockery and utensils. There are male and female toilets, showers and washbasins with electric shaver points. Large dining room/lounge area. The whole of the property is centrally heated and carpeted throughout. There is an ample parking area for all guests. Guests have the benefit of a stunning new leisure centre offering a 15 meter indoor, heated swimming pool, jacuzzi spa, sauna and gym. A great place to relax at the end of the day! 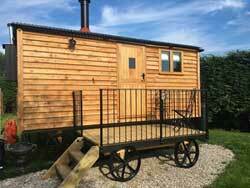 From May 2018 Stacksteads will have a luxury shepherds hut with fitted double bed, en-suite shower room, kitchenette and log burner. Situated in a private garden with lovely views it will be ideal for couples who want to get away from it all and explore the beautiful Yorkshire Dales. Caravan and Campsite We also offer a Caravan and Campsite with touring pitches and tent accommodation.